Bob Sponeybarger was born in 1940 in Emmaus, Pennsylvania. After receiving his bachelor's degree from Penn State, he entered Officer Training School on August 10, 1962, and was commissioned a 2d Lt in the U.S. Air Force at Lackland AFB, Texas, on November 6, 1962. Lt Sponeybarger next completed Undergraduate Navigator Training and was awarded his navigator wings at James Connally AFB, Texas, in November 1963, followed by Electronic Warfare Officer (EWO) training at Mather AFB, California, from December 1963 to July 1964. He completed B-52 Stratofortress Combat Crew Training in December 1964, and then served as a B-52 EWO with the 596th Bomb Squadron at Dow AFB, Maine, from December 1964 to May 1967. Capt Sponeybarger then attended Undergraduate Pilot Training, receiving his pilot wings at Laredo AFB, Texas, in May 1968. His next assignment was as an F-111 Aardvark pilot with the 429th Tactical Fighter Squadron at Nellis AFB, Nevada, from July 1968 to November 1968, and with the 428th Tactical Fighter Squadron at Nellis from November 1970 to April 1972. He then deployed with the 429th Tactical Fighter Squadron to Takhli Royal Thai AFB, Thailand, from April 1972 until he was forced to eject over North Vietnam on December 22, 1972. Capt Sponeybarger managed to evade the enemy for 2 days before being captured and taken as a Prisoner of War on Decmeber 24, 1972. After spending 96 days in captivity, he was released during Operations Homecoming on March 29, 1973. He was briefly hospitalized to recover from his injuries at March AFB, California, and then served as an instructor pilot with the 71st Flying Training Squadron at Moody AFB, Georgia, from August 1973 to July 1974. 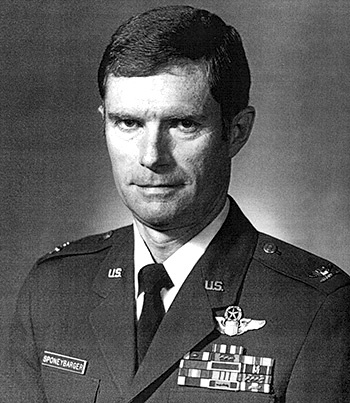 Maj Sponeybarger next served as Social Actions Officer for the 38th Flying Training Wing at Moody AFB from July 1974 to July 1975, followed Air Command and Staff College at Maxwell AFB, Alabama, from August 1975 to June 1976. LtCol Sponeybarger served as an Air Operations Officer in the Tactical Fighter Training Division with Headquarters 12th Air Force at Bergstrom AFB, Texas, from June 1976 to January 1980, and then as Commander of the 4444th Operations Squadron with Headquarters Tactical Air Command at Langley AFB, Virginia, from February 1980 to October 1982. His next assignment was as Assistant Deputy Commander for Operations and then Deputy Commander for Operations of the 48th Tactical Fighter Wing at RAF Lakenheath, England, from November 1982 to August 1985, followed by service as Commander and Professor of Aerospace Studies with the Air Force ROTC detachment at the University of Massachusetts from August 1985 until his retirement from the Air Force on September 1, 1988. Captain Robert D. Sponeybarger distinguished himself by gallantry in connection with military operations against an opposing armed force near Hanoi, North Vietnam on 22 December 1972. On that date, Captain Sponeybarger, as Aircraft Commander, struck a vital storage area in the heart of Hanoi destroying a significant quantity of stockpiled military supplies. Despite intense and extremely accurate antiaircraft fire and the surface-to-air missile threat, Captain Sponeybarger continued his mission. Suffering the loss of one engine over the target, Captain Sponeybarger was still able to direct his aircraft out of the immediate Hanoi area before he was forced to eject. By his gallantry and devotion to duty, Captain Sponeybarger has reflected great credit upon himself and the United States Air Force.